Endless Summer Getaway……the name says it all. This fabulous upgraded three bedroom three bath home boasts pride of ownership along with a feeling of hospitality. As you enter into the home you walk into the living/family room, then straight ahead is the sliding door that leads to the outdoor pool area. The sitting room and Kitchen are off to the left side of the house and the bedrooms are located in the back half of the house. Two of the bedrooms feature their own private bath, and one of the bedrooms lead out onto the poolside were you can soak up some of the Hawaiian Paradise. Just installed Central Air Conditioning!! One of the best beaches in Hawaii 'Kailua Beach' is just an easy 5 minute walk away. .....and for us its relaxing and enjoying the great vibe of the islands. Fantastic place to stay in Kailua! Very clean. Beautiful. Seemed like every detail was attended to. We enjoyed our week at Endless Summer. It is a clean, spacious, well maintained, and comfortable home on a quiet residential street. It has multiple outdoors sitting areas. It is such a nice house and is just a short walk to the beach; less than 5 minutes. Misty was easy to communicate with and was very accommodating in allowing us to check in early once the cleaners were finished cleaning the house, which we greatly appreciated. Endless Summer was the perfect place for our ‘family & friends’ trip to Kailua. Spacious home with three bedrooms and three bathrooms, 1 block from a beach park. The house had plenty of room for all of the people in our group. The neighborhood was quiet with easy beach access. The kitchen was very adequately equipped. All the appliances worked, including the clothes washer and dryer and the dishwasher. 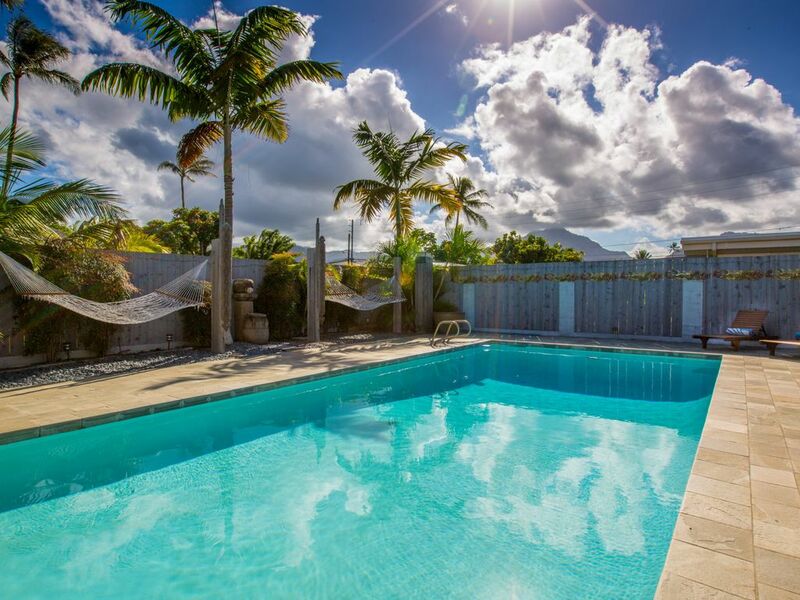 Great house, close to beach, but the pool is freezing! We stayed at this home over Thanksgiving and normally I wouldn't take the time to write a review - but I feel that people must know about the pool. The check in started out a little rough, but Misty, the PM, was great to try and fix this issues as quick as possible. The house is great, 3 bedrooms with lots of "hanging out" space! You won't get the address until you arrive so we could only guess how close we were to the beach. When you first drive by there is some disappointment - you're about 7-8 homes back from the beach, but don't let that deter you! The walk to the beach with our two kids + beach chairs, boogie boards, food, etc was so easy! The biggest downfall of the home is the pool. We were SO excited to use the pool (it's the cover photo of the rental)... but it is FREEZING! We all got in and then got RIGHT BACK OUT. It is way too cold. If they didn't have the pool they wouldn't be able to charge what they're charging... and so that was a bummer. Literally plan on not using the pool at all. Everyone says that heated pools aren't economical in Hawaii - which I just don't get. We live in Seattle and heat our outdoor pool 6 months out of the year! It would hardly cost anything at all to heat a pool in Hawaii a few degrees to make it a little more tolerable. Unfortunately the weather was pretty cold and Kailua is definitely the windy side of the city! Kitchen addition suggestions: baking sheets, plastic drink cups for beach. Super easy walk to beach! Thank you for the great review. Unfortunately November has been very rainy and cold this year. We are definitely having a early winter for us. Hawaii is not a big "gas" state as in almost every home everything is electric so gas is not really an option and to heat a pool requires gas. Sorry, the colder the environment the colder the pool (same as the oceans). Thank you again for the great review.